McKinney Heating & Air Conditioning is here to meet all of your heating and air conditioning needs. We’ve been in the HVAC industry for over 45 years, and throughout that time, we’ve been fortunate to have served countless customers in the Martinsville, Fieldale and the surrounding areas. We continue to be a family-owned and operated business that closely manages all of our projects, and we look forward to providing you with quality service. We employ a highly trained staff and have experience with all makes and models, so you can always rely on us to get the job done right. In addition to our HVAC services, we also service and install water heaters, generators, and gas fireplaces. Count on the experts at McKinney Heating & Air Conditioning for all your home comfort needs. 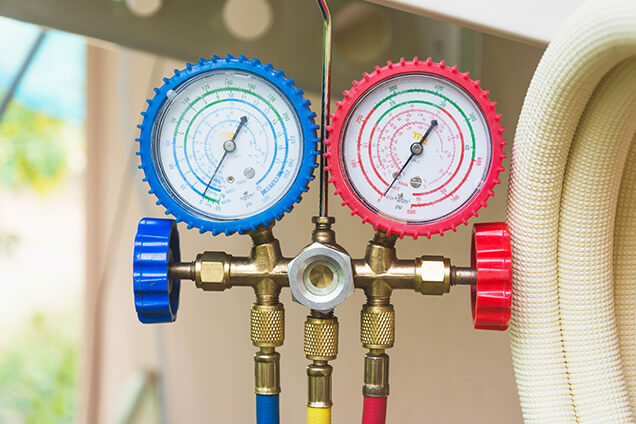 We can take care of any issue that you may be facing related to your furnace, heat pump, propane tank, or water heater. We can also address problems related to gas fireplaces. When you schedule an appointment, we’ll bring all of the tools needed to perform a thorough assessment. Because we drive fully stocked vehicles, we can usually solve most problems in just one visit. We’re available to perform installations and replacements for anyone in the Martinsville, Fieldale, and the Southside Virginia area, and we’d be happy to provide recommendations if you’re unsure of what type of unit to purchase. When the weather warms up in the summer, you want your home to be a comfortable escape from the heat. However, without proper maintenance, you’re at risk of a breakdown when you need your AC the most. McKinney Heating & Air Conditioning can regularly maintain your unit by cleaning and replacing filters, tightening up connections, and removing dust and debris from air vents. You can turn to McKinney Heating & Air Conditioning for any heating and air conditioning problems you’re having. Financing is available in certain situations upon approved credit, and we also work on dehumidifiers, humidifiers, and clean air systems. Contact us today for all of your heating and air conditioning needs in Martinsville, Fieldale or the surrounding areas. From the time we pick up the phone until we take payment we strive for a superior and complete customer experience. Our technicians are Master Tradesmen, BPI Certified, and NATE Certified - with over 250 combined years of experience! We realize our people are the most important asset our company possesses and we invest in them to ensure we train and keep the best available for you.